I’ve been getting such emails now for years since I moved to France. In my view, the major reason for the attacks on Jewish targets is political rather than racial. The leadership of the Jewish community in France (which does not represent the majority of French Jews) has been outspoken in supporting the right-wing policies of the current Israeli government. What has long bothered me about such emails, however, is not just a misreading of the cause, but a tunnel vision on the part of many Jews. There is a total disregard for those other Semites and the rampant growth of anti-Islamic and anti-Arab sentiment in France and across Europe over the past few years. The number of attacks on Arab targets and new legislation relating to the practice of Islam in several European countries would have the world’s Jewish community in full cry if they’d been directed against Jewish targets. Three men, a Frenchman, a Tunisian and an Algerian, find themselves together in a raunchy Parisian bar. They down one beer after another. At one point the Tunisian tosses his empty beer bottle into the air, yells “we’ve got so many empty bottles in Tunis,” pulls out a gun and blasts the bottle apart in midair. The Algerian also throws his bottle into the air, says “we’ve got so much sand in Algeria, there’s no shortage of glass,” pulls out a gun and shatters the bottle. The French guy takes a disgusted look at the other two, pulls out a pistol and yells, “we’ve got so goddamn many Arabs in France, I never have to drink with you two creeps again,” and he guns both of them down. I was still thinking about that the next day when news came of the horrific slaughter in Norway and the gradual disclosures that the suspect was not an bearded Arab terrorist, but a clean-cut white, right-wing terrorist convinced that he was a soldier in the War of Civilizations, defending the Christian West against the threat of Islam. On his site he wrote approvingly of Islamophobic American blogger Pamela Geller, a frequent guest on Fox News, who also raises the banner of the West against Islam. A poster shows a recent event, which she backed, along with Robert Spencer who operates Jihad Watch. People like Geller and Spencer, and right-wing leaders across Europe, are already attempting to distance themselves from any responsibility for the outrage in Norway. Their excuses ring hollow, in view of their rabid language and incendiary rhetoric. 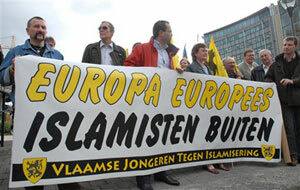 But a more basic question is this: To what degree do the growing anti-Islamic views held by tens (if not hundreds) of millions of “decent” Europeans, folks who would never consider themselves right-wing or racist though they might chuckle at the barroom joke above, contribute to what could be even more horrifying acts to come? For with growing economic turmoil in Europe and huge numbers attempting to flee the bloody uprisings across much of North Africa, this problem is going to get only worse.